As temperatures begin to plummet and images of the first sprinklings of snowfall start sneaking into your social media newsfeed, there’s sure to be one undeniable, underlying thought crossing your mind: winter is here. Don’t let the cold weather catch you by surprise this year. 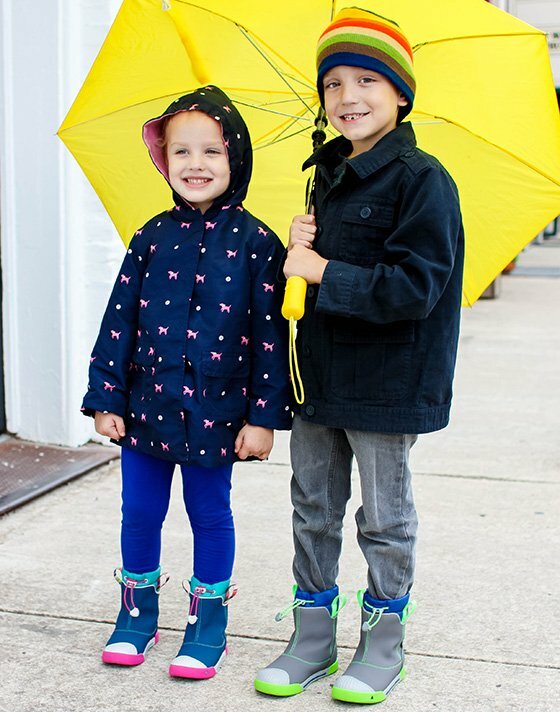 We are here to help you prepare to take the storms by storm with our favorite roundup of some of the very best, most unique and downright coolest kids’ outerwear this season! From jackets to boots and even the sweetest little hat and mittens set – we’ve got something for everyone on our 2015 Winter Wonderland Kids’ Outerwear Guide! From waterproof, insulated jackets for kids who just can’t stay indoors during the winter months, to dressier, trendy winter coats for the tiniest of fashionistas who need to stay toasty on their way to holiday parties, we’ve got the perfect outerwear for every little person in your life! It started over twenty years ago with a sense of humor, a talented painter Alice Oldland, her restless husband John, and The Little Blue House gift store in the lakeside village of North Hatley, Canada. Alice, inspired by the countryside around her, had just finished a series of paintings depicting farmyard animals. Needing a venue to show her work, Alice opened a gallery above her gift shop, The Little Blue House. John watched the paintings sell and thought he could create a line of aprons based on Alices artwork. 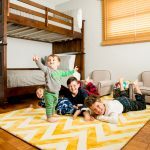 Their family has created an extensive children’s line that is both inspired by nature and ecologically responsible. The company still rests on the principles on which it was founded, which are: family, good design, quality and of course, loads of laughter. 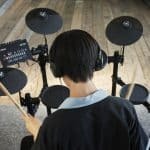 They are also a company that focuses on giving back. They support the Open Door Mercy Home Orphanage by helping in providing funding for the many needs of children. Hatley’s products are built to last! 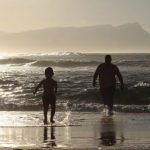 As a company, they believe that the key factor in helping the environment is to produce products that are crafted to last through the use of many children. They strive to ensure that everything they produce is made from natural fibers, in a way that is environmentally sensitive. The Reversible Puffer Jacket asks one major question: Fun pattern or cool solid color? Life’s full of tough decisions. Whichever side of the reversible winter puffer your children decide to wear, you can be sure it’ll keep them warm and dry. When the snow falls, make sure your kids are equipped with the best gear. 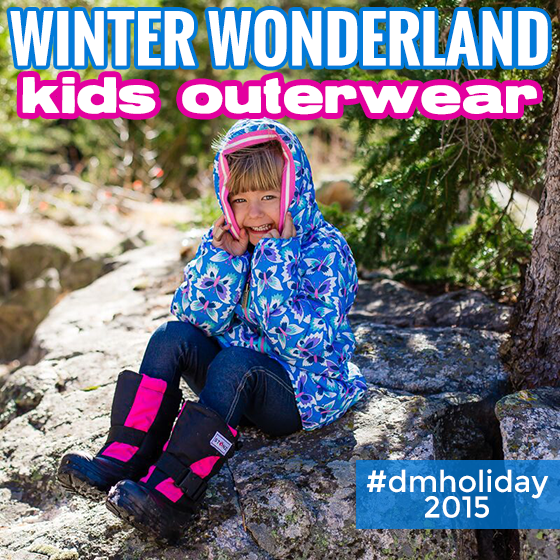 At Daily Mom one of our FAVORITE things about Hatley is that their boots and jackets are 100% PVC Free! Hatley’s Reversible Winter Puffer Coats are perfect for any child who loves to explore the outdoors in style- no matter the season. Your child will love choosing which side of their coat they feel like sporting that particular day (and anyone with a small child knows that can change daily! 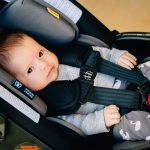 ); and you’ll love the quality materials on the inside and outside, as well as Hatley’s commitment to the environment and charitable causes. Chasing Fireflies was created to celebrate childhood, as well as parenthood. Do you remember the first time you ever rode a bike or had ice cream for dinner? 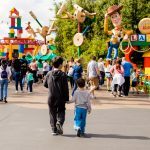 Sure, it was fun when you did it; but, as parents, it’s way more fun to experience your child’s firsts with them. Chasing Fireflies has taken great care in selecting magical childrens’ products that are sure to charm, surprise and delight your child (and you!). 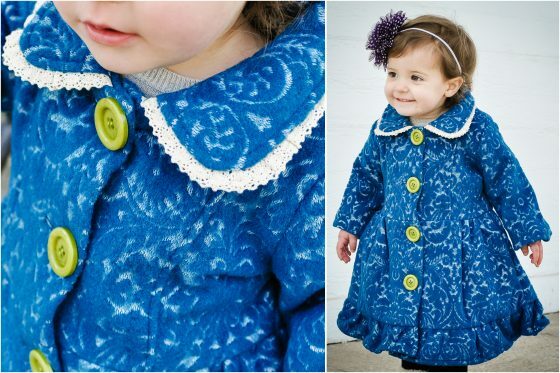 There is nothing quite as magical as a little girl in a beautiful winter coat; and your little one will dazzle in this Jacquard Ruffle Coat from Chasing Fireflies. From its rich, turquoise color, to exquisite jacquard pattern and a delicate lace-trimmed collar, there is no detail left unthought of. This stunning coat is perfect for all the activities you have planned this winter – from casual playdates, to dressy holiday parties. We love how versatile this coat is for any occasion! We adore the whimsical lime green oversized buttons that draw attention to the front of this coat, and the row of ruffles adorning the bottom, for some extra flair. The best part? The Jacquard Ruffle Coat is actually machine washable; which is pretty exciting – and unusual – for this kind of exquisite item. This is one coat that is sure to turn heads this winter. It even has an adorable floral lining that adds a little extra something special. Don’t think that Chasing Fireflies forgot about ensuring that little guys are both dapper and warm this winter! With this handsome Double breasted peacoat he will stay warm and fashionable throughout the season. It is soft to the touch and has a cozy quilted lining. This peacoat is a great compliment to dressy holiday outfits, but will also pair perfectly with jeans and a long sleeve tee shirt. 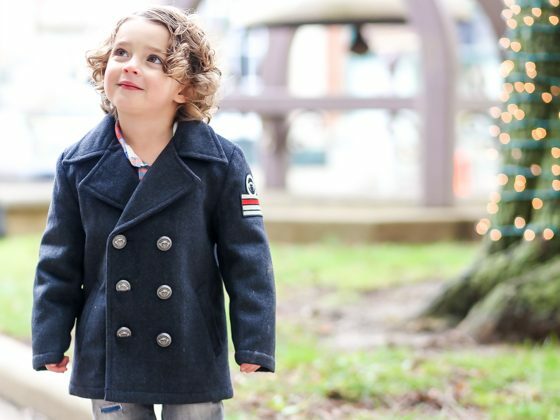 While puffy winter coats are a necessary addition to a winter closet, the peacoat is certainly equally as important and even more adorable for the fashion forward little guys in your life. 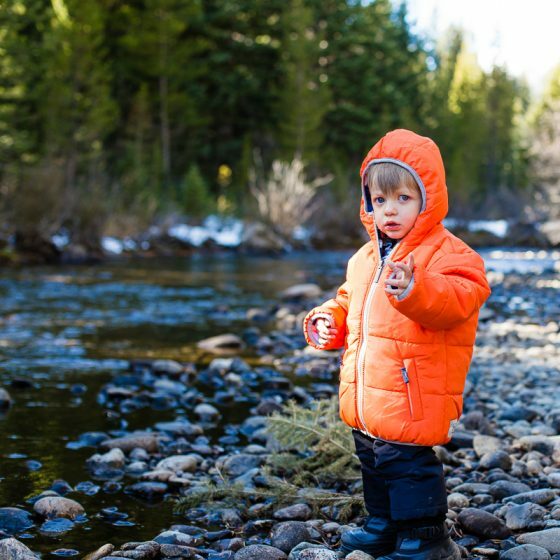 Chasing Fireflies has a large catalog of stunning outerwear for both boys and girls. 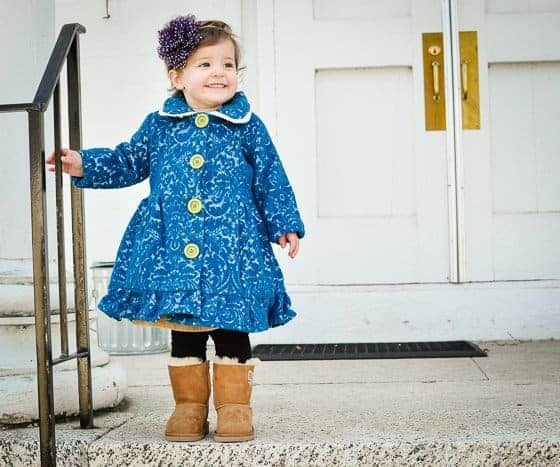 This Jacquard Ruffle Coat is a beautiful classic coat with a modern twist that will keep your little girl warm and stylish all winter long. 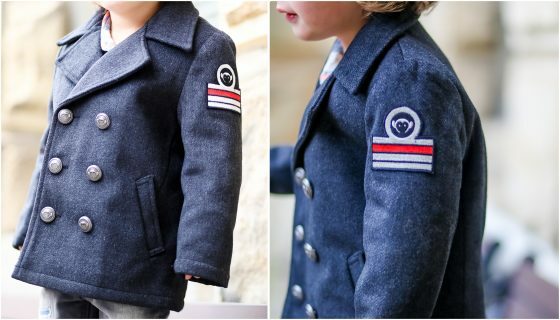 And the Double Breasted Peacoat is ideal for any fashion-forward little guy in your life. Kushies Baby USA is now located in Niagara Falls, New York; and the Stoney Creek Ontario location houses state-of-the-art manufacturing equipment and a staff of over 200. A meticulous inspection standard for the ever-expanding product lines, which currently stands at over 350 baby products, ensures the continuation of the company’s high-quality standards and ever-growing popularity. The new Blue Banana Snow Pants are fully lined with ultra-soft sherpa for luxurious comfort and warmth; and are specifically designed with the modern mom in mind. These affordable snow-bibs feature a fleece upper with an easy in/out zipper and wide straps, so you don’t have to mess with thin straps that keep falling down. They will stay in place for hours of outdoor fun. 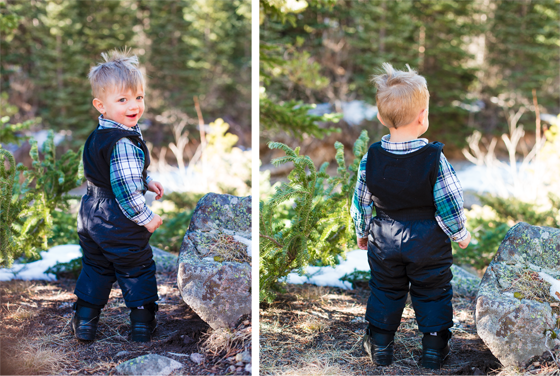 The cinch-able bottoms fit snuggly around snow boots; keeping little legs dry and tiny feet toasty warm. If you live in a place that gets a decent amount of snow and your child loves frolicking in it, they will be warm and toasty in the Blue Banana Snow Pants; and spend hours outdoors building Olaf and trying to find Elsa. It’s perfect for the active child who loves outdoor play all winter long. From fashion to functionality, we’ve rounded up a complete list of the very best boots for every situation. Your little ones will confidently tackle rain, snow, cold weather and the fashion police with any pair of our favorite boots to beat the winter blues! Chasing Fireflies was created to celebrate childhood, as well as parenthood. Do you remember the first time you ever rode a bike, or had ice cream for dinner? Sure, it was fun when you did it; but, as parents, it’s way more fun to experience your childs firsts with them. Chasing Fireflies has taken great care in selecting magical childrens’ products that are sure to charm, surprise and delight your child (and you!). As die-hard lovers of Ugg boots, we nearly fell out of our seats when we discovered the personalized versions for both little girls AND little boys. They offer the Classic Satin Bow Ugg boots for girls and the Personalized Ugg Boots for boys. The Classic Satin is available in 6 different colors – gray, chestnut, hot pink, navy, purple, and black, so there’s a color to suit your little girl’s style; and what’s even more exciting is the personalization options that you can get only at Chasing Fireflies. For the boys you can choose a bold black or the classic chestnut color. Each of these styles offers the option of personalizing them with your little ones initial on one boot. For the little girls you even have a choice of 5 icons on the other boot – all in sparkly rhinestones. These boots are incredibly warm and cozy; and are truly the ultimate in fashionable winter footwear. These mid-calf boots are perfect paired with leggings, skirts or any other outfit combination that your daughter loves to wear. 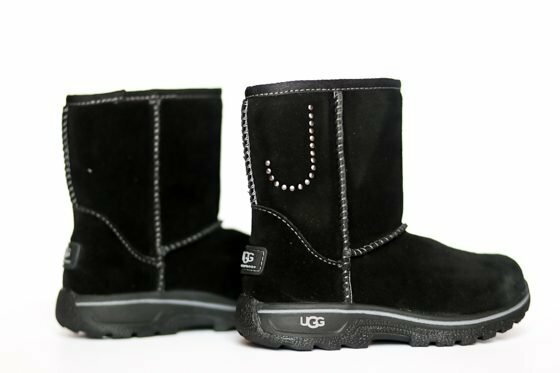 She will stand out from the crowd; and all her friends will want to know where she found Ugg boots with the special rhinestone accents. You’ll only wish you had a pair in your size! (Hint: they’re available for women too!) For your little guys you can be sure that these boots can be dressed up with a dark pair of jeans or slipped on and pulled up over their sweatpants for a busy yet cozy day full of errands. Chasing Fireflies has a wide variety of personalize-able shoes, and these personalized Ugg boots are perfect for your little girl. She’ll feel extra special in these unique boots made just for her; and the extra sparkle will complete any outfit this winter. And the personalized Ugg boots for boys will add an element of style to your little guy’s outfit as he tackles whatever winter weather comes his way. KEEN is a company committed to environmental preservation and quality, American-made products. Based in Portland, Oregon, KEEN contributes to nonprofit organizations in an effort to inspire responsible outdoor participation and help “preserve the places we play.” Now producing 20 styles in their Portland warehouse, KEEN offers a variety of durable and responsible footwear options for children and adults. The newest product soon to debut at KEEN is their comfortable and cute rain boots. 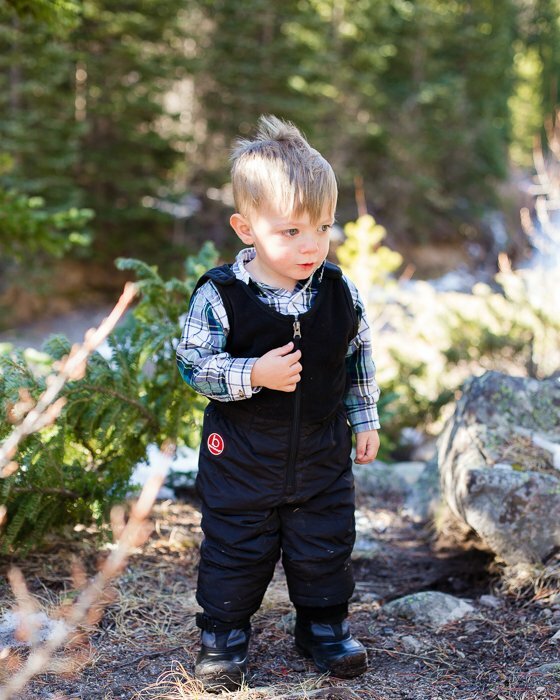 With insulated sides and a top cinch to keep water and mud out and warmth in, little toes stay warm and dry! Easily washable, these boots will come clean after a romp in puddles or a day exploring in the elements. While most rain boots offer water protection but no insulation, KEEN boots are lined to keep your child’s feet dry and warm. Bright color combinations and non-marking soles make this boot a style that children and adults are sure to love. We love the reinforced toe, which ensures that your child’s boots will withstand all of the rainy days and rough explorations that the days ahead may hold. Keen boots are ideal for any active kid in your life. Keep your child’s feet warm, dry and stylish in these beautiful boots! KEEN boots are made to last and are easily cleaned, so you can be sure they will look great until your child outgrows them or no longer needs them! When it comes to boots, Kamik is one of the oldest, most trusted companies around; and remains family owned and operated to this day. Starting in 1898, Kamik has been keeping feet warm, dry, and protected from the elements. Their products are inspired by the Canadian North; which means that they’re the very best boots for winter weather. Each pair of Kamik boots has been created with cutting edge technologies, such as lightweight yet durable rubber soles, super-insulating inserts, and more. 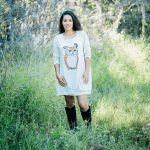 With over 70% of their boots made in the USA or Canada, and a large-scale effort to be sustainable and green, this is a company that you can feel good about supporting. 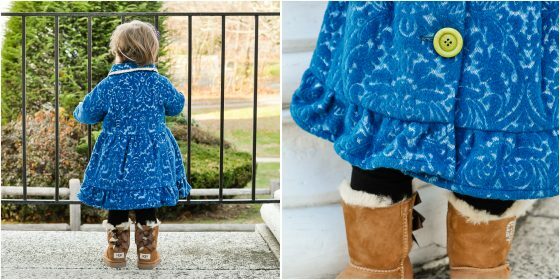 Kamik boots are among our all-time favorite winter boots for little ones. They stand up to some serious play – and cold, snowy, icy weather! Kamik’s Glacial boots are top of the line boots for your child, at an affordable price. Featuring Kamik’s own Rubber HE technology (surprisingly lightweight, and PVC-free rubber), removable 9mm Zylextra liner (comfort rated to a frigid -58ºF/-50ºC), and NiteRays reflective technology, your child will be safe and warm this winter. These boots will delete, “Mom! My feet are cold!” from your child’s vocabulary. 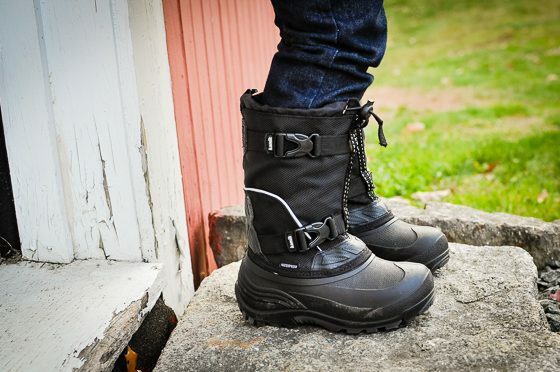 Rubber HE soles give these snow boots superior traction even in slick, slippery situations; and Kamik’s seam sealing ensures these boots stay truly waterproof in all kinds of weather situations. These Glacial boots are also easily adjusted by two buckles; and the bungee cord at the top of each boot helps to keep snow out and feet warm. 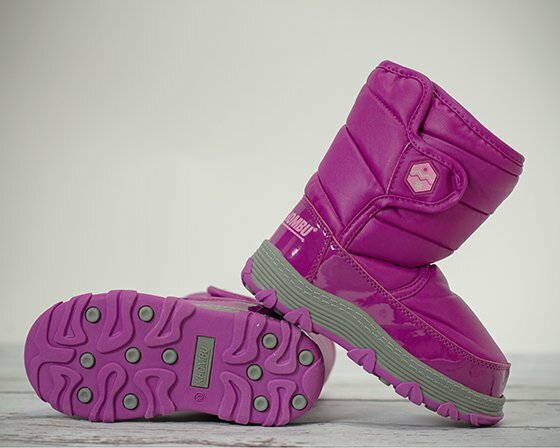 For the little girl in your life, we love Kamik’s Iceberry boots. These boots have many of the same features as the Glacial boots, including seam sealed waterproof technology, comfort rated to -40ºF/-40ºC, removable 8mm Zylex liner, and incredibly lightweight and grippy Rubber HE soles; but with a girly twist that your daughter will love. 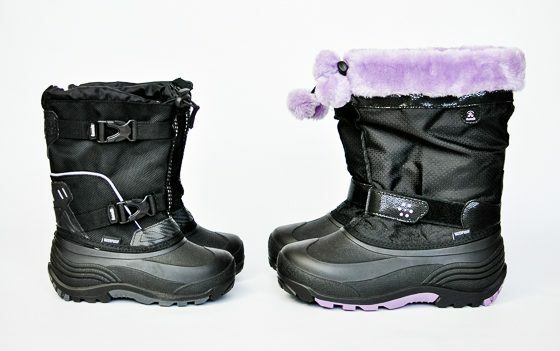 Each pair of Iceberry boots has an easy-to-adjust velcro strap with a grip tab on the end, making for easy adjustments while wearing gloves or mittens, as well as Kamik’s bungee cord at the top of the boot, helping to keep warmth in and snow out. Your daughter will love the touch of sparkly black fabric and puffy snowball tassels! Kamik boots are the ultimate in winter boots; and are at the top of our list when we’re buying new winter gear for our little ones. These boots are incredible for cold weather climates; and are so durable that you can easily use them as hand-me-downs in your family, kid after kid. In 2003, Lisa Will, an outdoor-loving mom living on Canada’s west coast, discovered that finding winter footwear for her two young kids was nearly impossible. 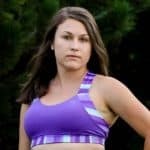 She and her friend set up designing prototypes and finding the absolute best and functional shoe for children that will withstand any element it runs across. Based in Vancouver, BC, Stonz Wear is a leading Canadian brand manufacturer of children’s outerwear products. The company offers a range of durable and functional booties, hats and mittens suitable for infants through toddlers and up. 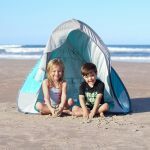 Quality, innovation, function and style are the four signature elements of all Stonz products; and each offering is designed to help active parents share the great outdoors with their children. All Stonz products are handmade in Canada and are available throughout North America, Europe and Japan. 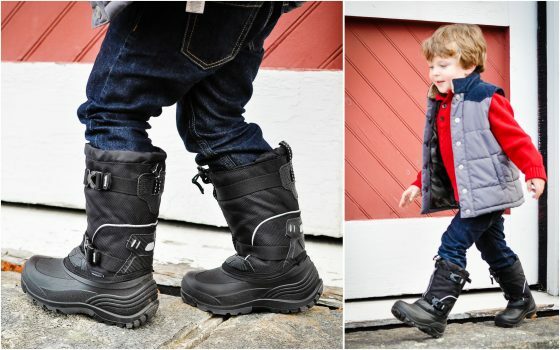 The Stonz Winter Bootz are super lightweight winter boots and designed with kids in mind. They feature a slip resistant sole, coupled with a 600D nylon upper. These impressive and functional kid’s boots will withstand temperatures down to -50C/-58F. 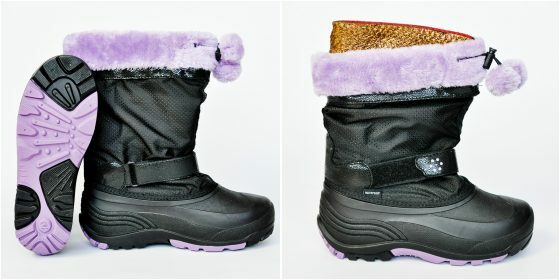 The Stonz Winter Bootz are the perfect winter shoe for your child to sport for tons of outdoor enjoyment. They are remarkably lightweight; so getting around won’t be daunting for them. They’ll love wearing these boots in all elements, from rain to snow to sunshine. 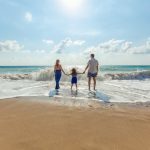 A family owned business, Khombu‘s goal is to provide innovative footwear with unique features and benefits, delivering weatherproof protection, exceptional performance, comfort and great value. With a rich heritage in the rugged boot market, Khombu delivers the ultimate in functionally engineered footwear complemented by contemporary styling to meet today’s outdoor lifestyle needs. Khombu products use leading edge materials, and, depending on the intended use of the specific model, contain materials such as Thermolite® for warmth, Nylex® linings for comfort, Micro-tex® upper materials for waterproof protection, sure-grip flexible outsoles for traction and water and stain resistant leathers, among other high quality leading edge materials to improve your comfort and provide a high performance product. They make Built In America boots for adults that were designed with the U.S. Ski Team as well. Whenever you are going out into the elements, Khombu delivers unprecedented protection, comfort, performance and value for the whole family. 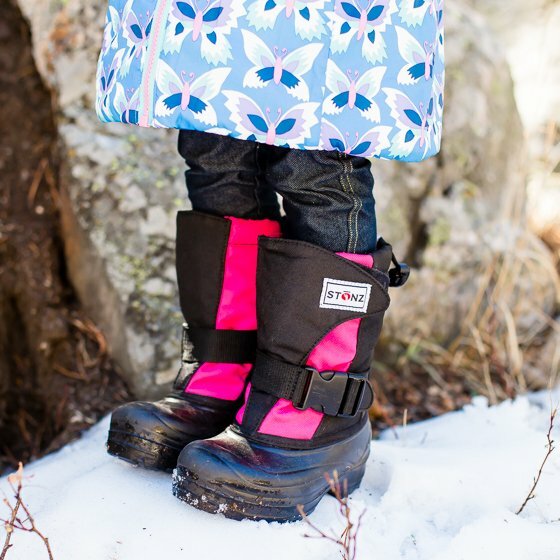 Khombu’s Juniper Snow Boots were designed to keep your little one warm and cozy while they play in the snow. 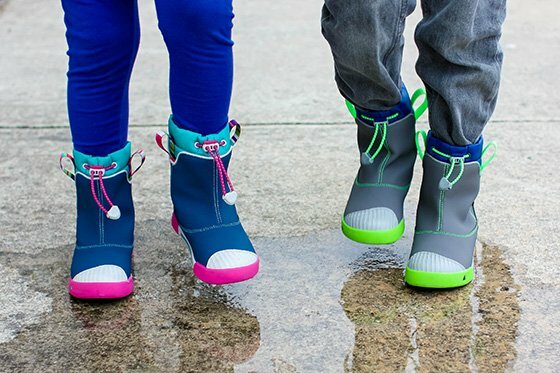 They are colorful childrens winter boots that are waterproof and affordable. 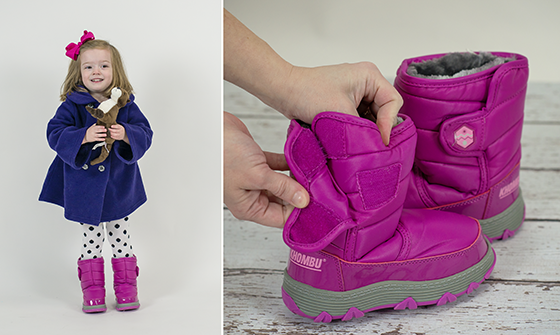 The only problem is that the Khombu Juniper Snow Boots ability to keep your little one warm and dry may outlast your endurance in the snow! This classic, easy-on closure boot is designed to protect your children’s feet against the elements. Khombu Snow Boots are perfect for the whole family. Khombu delivers unprecedented protection, comfort, performance and value. If it lives up to the standards of the U.S. Ski Team, it should be able to stand up to what your little one can throw at it. Top off their outerwear look with a cashmere hat and mittens set. Ultra soft, incredibly warm and super adorable. Who could ask for anything more? Melissa Wang launched Eden & Zoe in 2013 with a wish to keep her daughters comfortable, cozy and stylish. 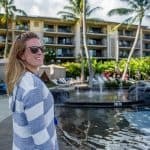 Her girls decided that the wool knitwear she was finding in retail stores for children was too itchy, so she started looking into cashmere for them. Her aim is to design cashmere knitwear for children that is sophisticated and understated. She believes in classic styling with a modern twist; while paying attention to details that make a garment unique and timeless. The goal is that your child feels comfortable and confident in what she/he is wearing. Each collection is made in small quantities to ensure quality and exclusivity; and each piece is made from pure cashmere, created using a hand-operated knitting machine and finished by hand. Playful and stylish, with a pom pom thrown into the mix, the super soft and comfortable Chris Hat is the ultimate winter accessory for boys and girls. This cashmere hat is 100% natural, soft, breathable, lightweight, comfortable and warm. Whether you live in a state that receives a lot of snow or one that sees none, your child can wear cashmere in all climates because it has a high moisture content, which allows its insulation properties to change with the relative humidity in the air. Furthermore, it will become a timeless treasure, as cashmere is long-lasting and actually becomes softer with age. The more your child wears this hat, the more comfortable it will become. And, it will make the perfect hand-me-down which can be shared with future little ones or younger siblings. Wear a pair of these fun color block Bobby Mittens with your pom pom hat to keep your little one’s hands snug and warm. These color coordinating mittens are easy to put on, and so soft and comfy that he/she won’t want to take them off. Eden & Zoe hats and mittens are perfect for any child to wear this winter, no matter the heat (or cold) index. Ultra soft, super comfortable and chic, your child will not only be warm, but they’ll look adorable as they play all season long. 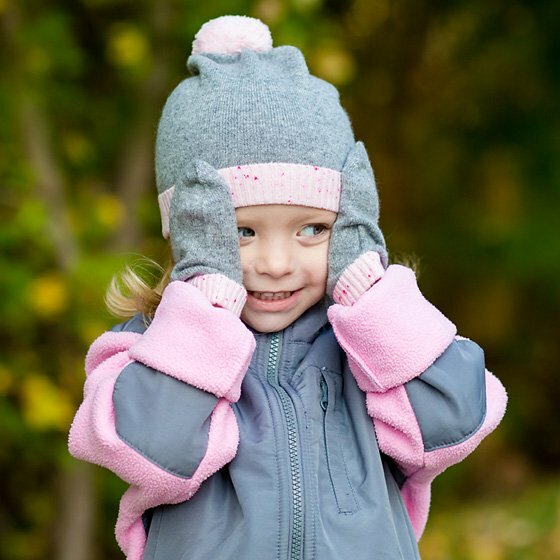 Keeping your little ones toasty and dry this winter doesn’t have to be difficult. 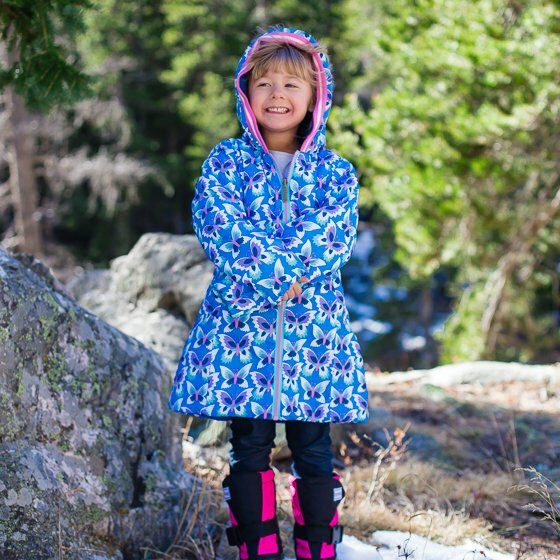 All the options you need are right here in our Winter Wonderland Kids’ Outerwear Guide. Be sure to check back in for our upcoming holiday guides!